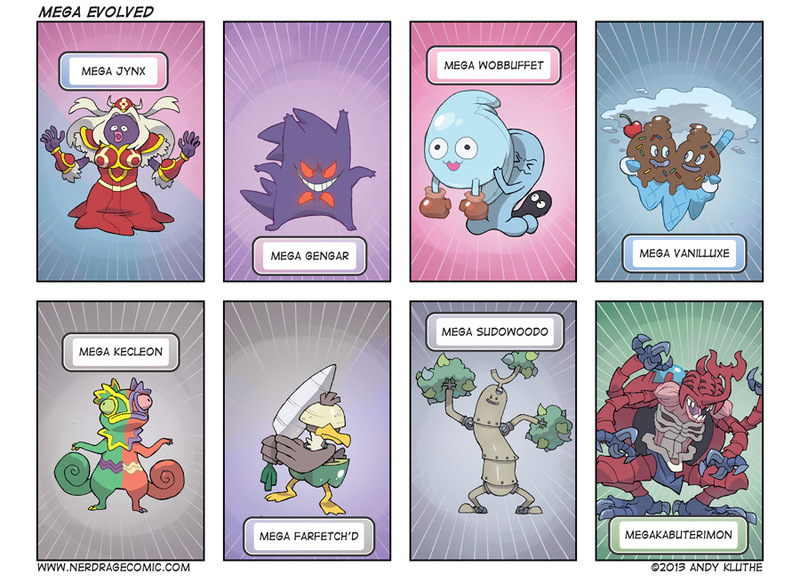 Nintendo has announced a new type of Pokemon transformation: mega evolution! Also, someone is going to have to point out that MegaKabuterimon is just his western name, the proper Japanese name is AtlurKabuterimon. And as an extra bonus, this week we've got double the Pokemon with a Nerd Rage Review. 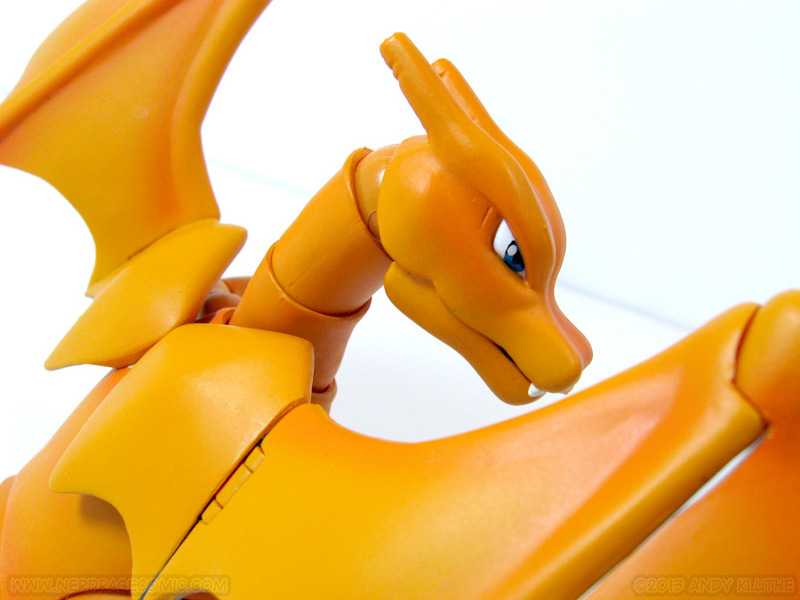 Click to skip down to my review of Bandai's D-Arts Charizard! 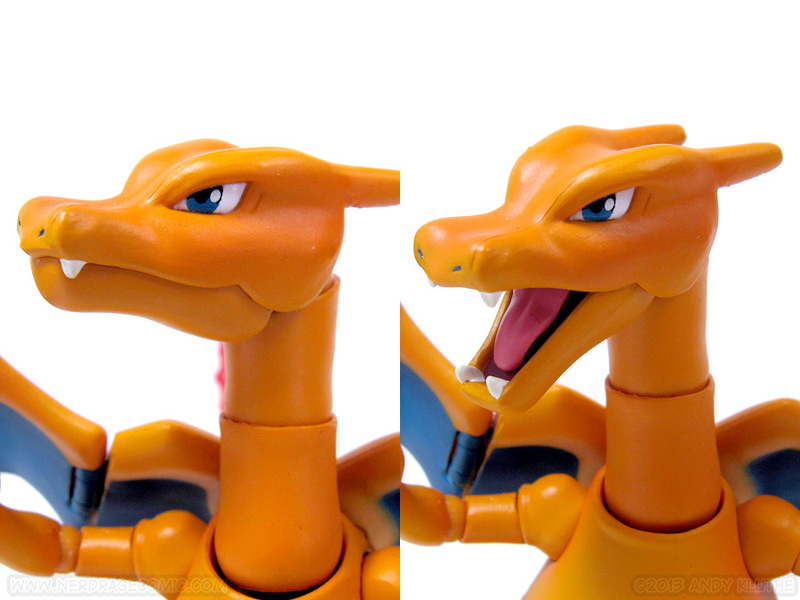 I’ve reviewed D-Arts Mewtwo. 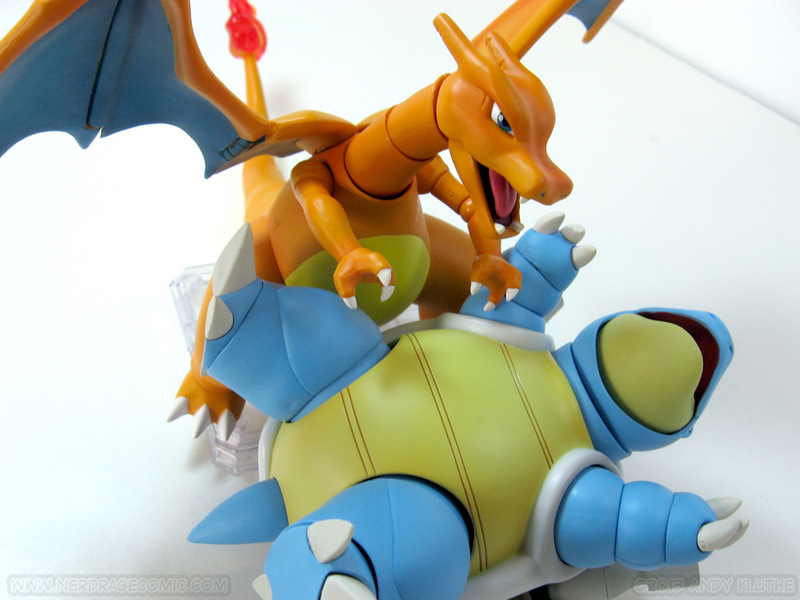 I’ve reviewed D-Arts Blastoise. This week it’s the review I thought would never happen. Generally people say that phrase because they couldn’t wait for a specific event. I literally didn’t think this package was gonna show up. Those that read these Nerd Rage Reviews know I’ve had rocky history with this one. I placed my order in April and – after being told they could do nothing in the way of a refund of my invisible package – I finally surrendered hope of getting my order. Well, shortly after that review I was contacted by Nippon-Yasan’s support staff, letting me know my package had been returned to them and would be reshipped with an upgrade to Fedex tracking! 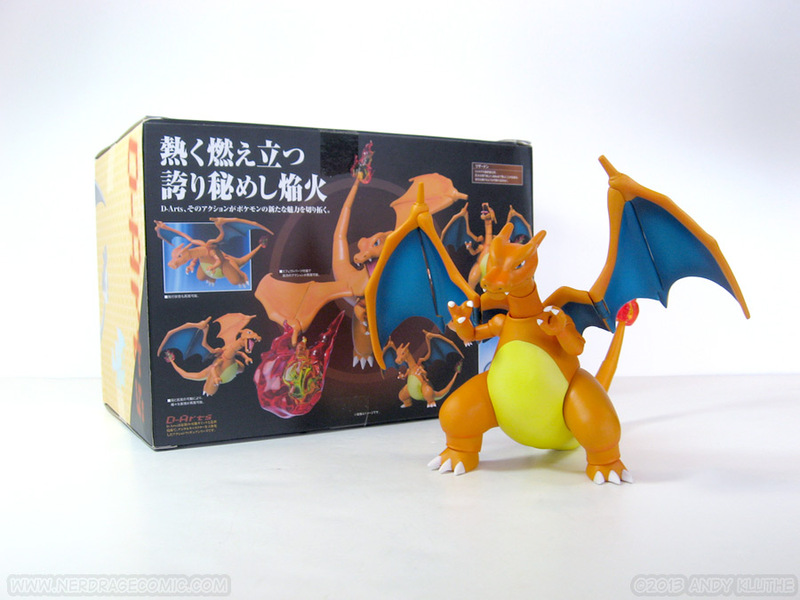 I hate reviewing cardboard, but Charizard gets some sort of trophy for the world’s biggest box. It’s hard to tell based on the picture, but it’s enormous. He fit in this thing diagonally, which means one whole side was almost empty, aside from a tail, effect part, and space-filling plastic insert. He’s only a couple ounces heavier than Blastoise, but his length means the package is a lot bigger. A bigger package means you’ll need to a bigger box to ship him. A bigger shipping box means it’s going to cost you more money. I guess they didn’t want to disassemble him for shipping, but it seems like there had to be a more efficient way of packaging this figure. 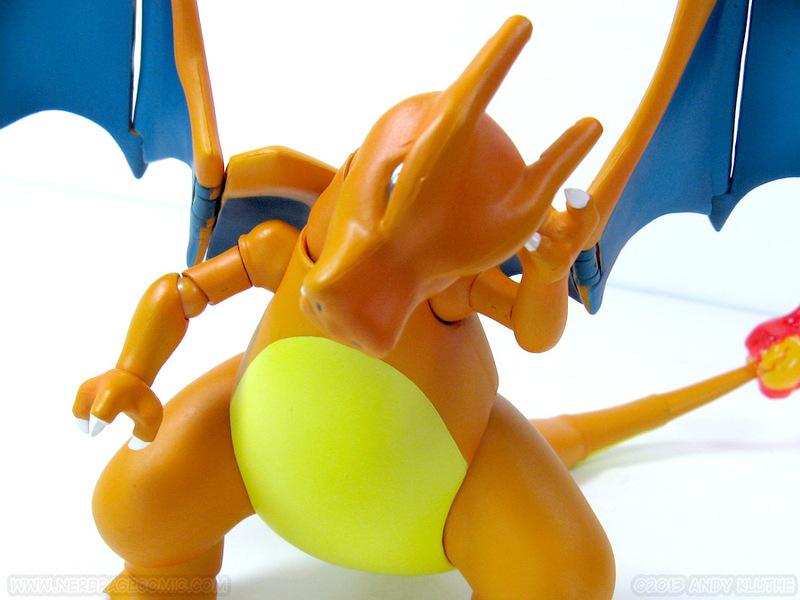 Charizard is a lot more flexible is impressive, at least after handling stubby ol’ Blastoise. 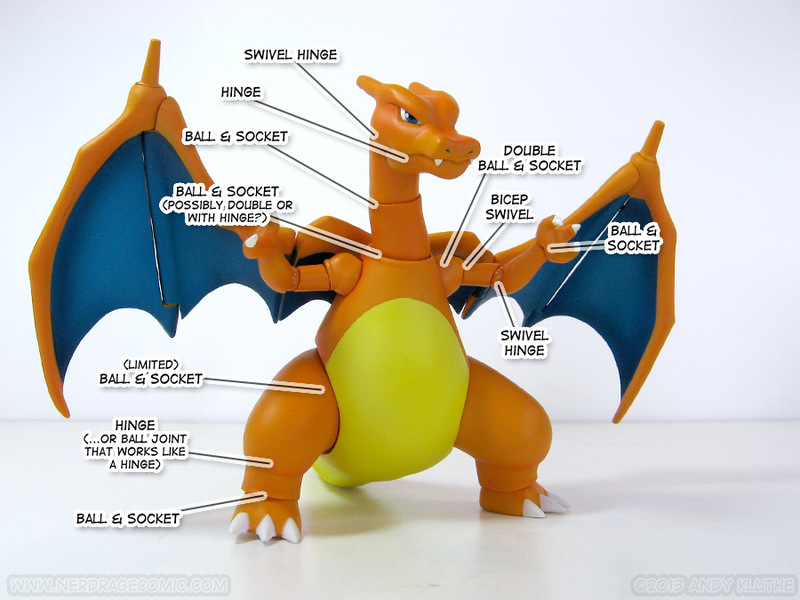 You’ll get a lot of movement out of the neck and his tail is segmented at each of the joints. The joint that connects the tail to the body can let the tail curl up or lie straight in a flying pose. The mouth opens and closes (although it looks a little strange when open) and the tongue is on a tiny ball joint that gives it a bit of movement. The wings are double ball jointed at the back but the way they attach you’ll get a lot more forward motion than back. It’s kind of a shame, because you can sweep them down front in a brooding, cloaked look but can’t swing them back away from the arms. 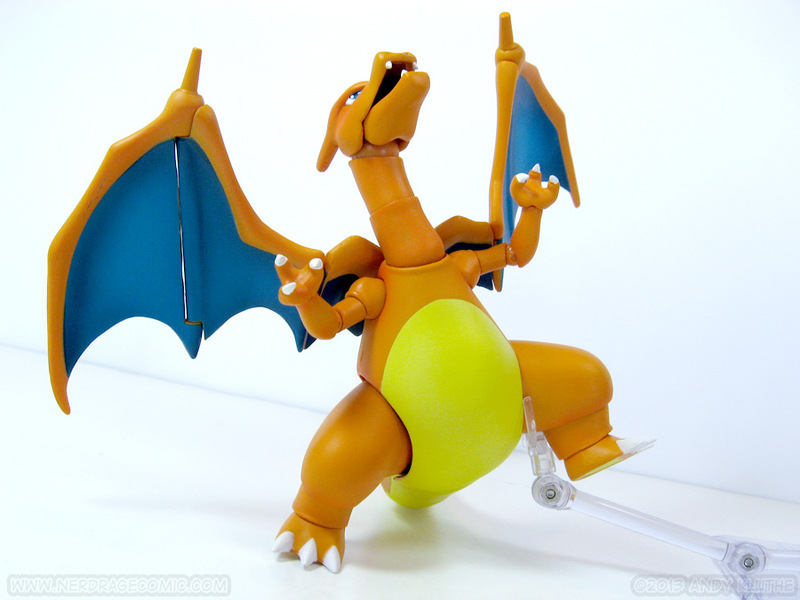 The legs are pretty limited, but after Mewtwo and Blastoise it seems like Bandai is interpreting ambiguous leg anatomy in a way that looks the most aesthetically pleasing in the default pose with the least amount of additional articulation. Remember my raving about those wonderful, matte paintjobs? Well, this is round three. The paint looks really nice with a lot of additional airbrushed shading Bandai didn’t need to apply. The wings look particularly detailed. What’s not-so-great is the same issue of the paint job feeling fragile. Except this time it’s is scuffing. I have a small point of wear on the neck, where it brushes the collar of the chest, and a couple other small specks around other joints. 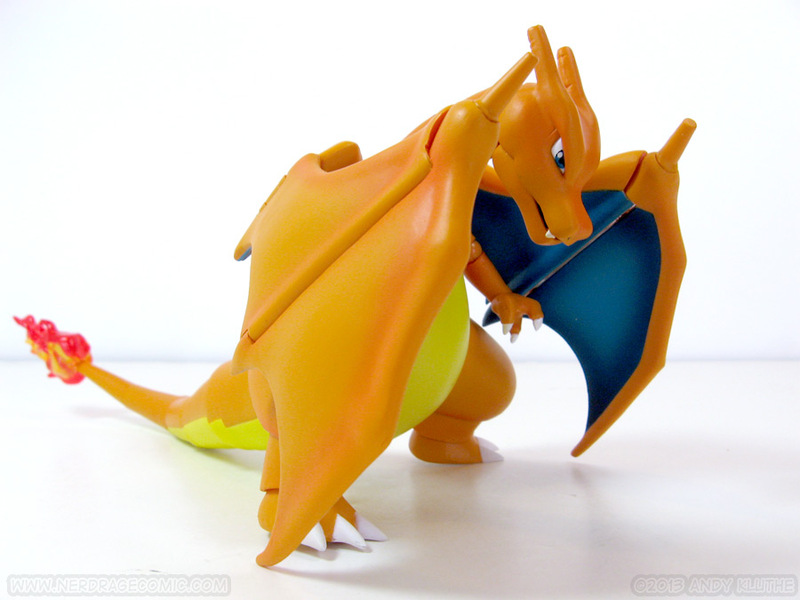 I have no idea if this is limited to my particular figure or if it was a problem with Charizard in general. 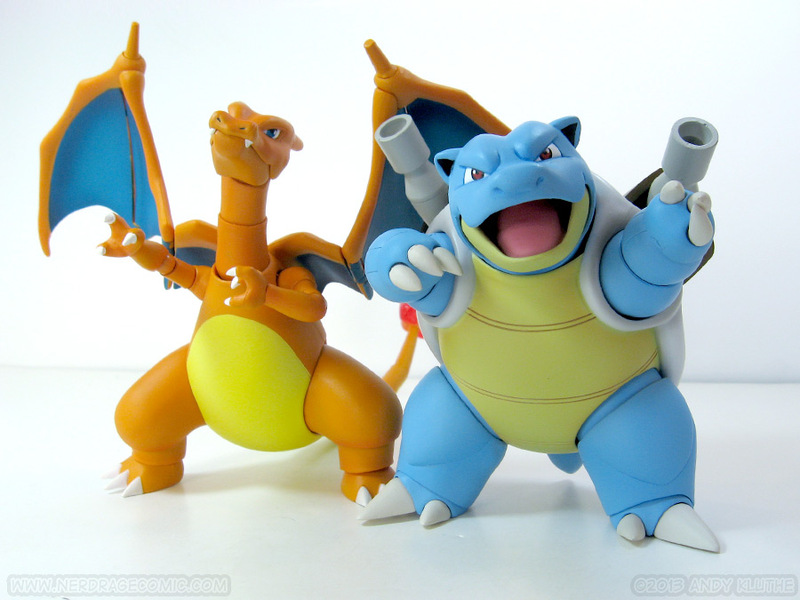 I’m in the weird position of getting Blastoise before Charizard, so maybe it’s something they worked out better by the third figure. Or it might be that not being an inarticulate brick leads to more paint wear. The sculpt is on model, but there’s also a certain amount of compromise between design accuracy and articulation in figures like this. 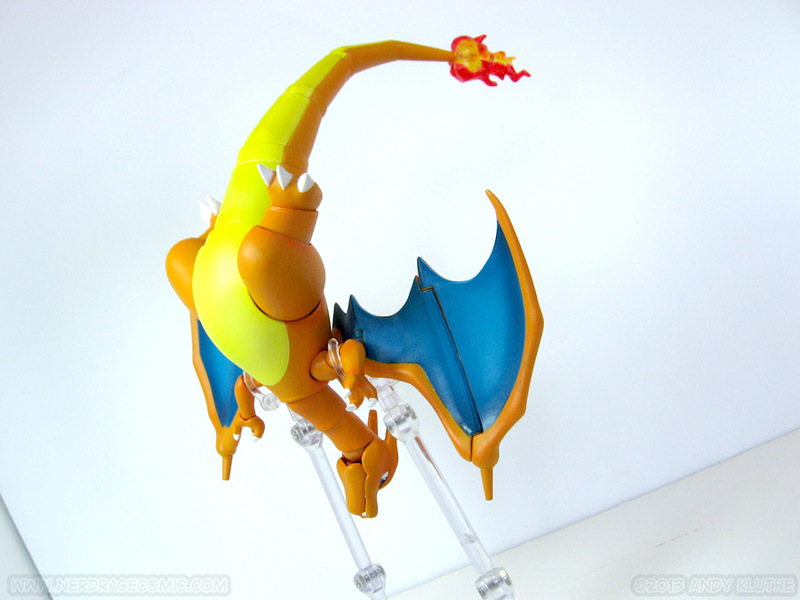 Bandai has opted to segment the tail and neck for posing, rather than render them in smooth, solid plastic. This isn’t an issue for me, I know I’m not buying a statue, but some would consider this a detractor. 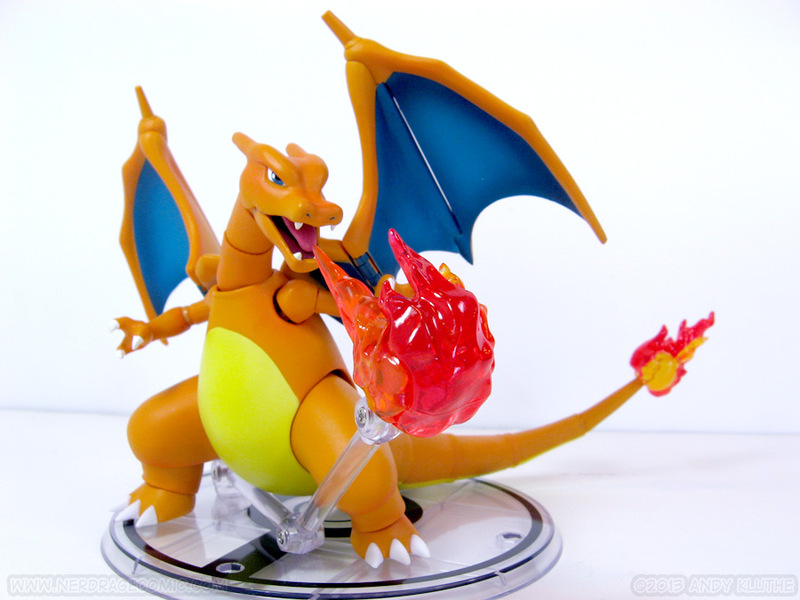 Charizard comes with the Pokemon Tamashii Stage stand, one arm for that stand, a grip, and a flame effect part. The flame pegs into the stand arm. 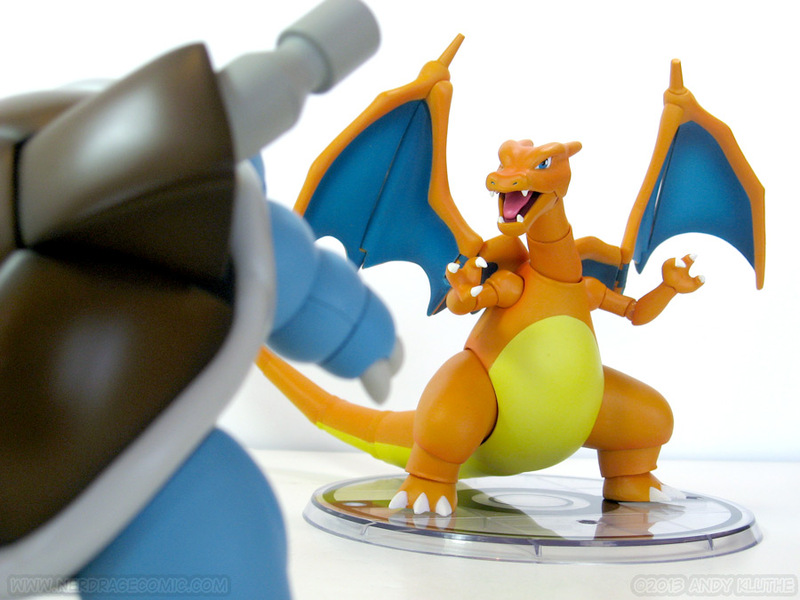 Like Blastoise, you’ll be hard pressed to get this stand to support Charizard with its grip. He’s heavy – heavy enough to stand stably on his own – and too heavy for one arm to hold up. 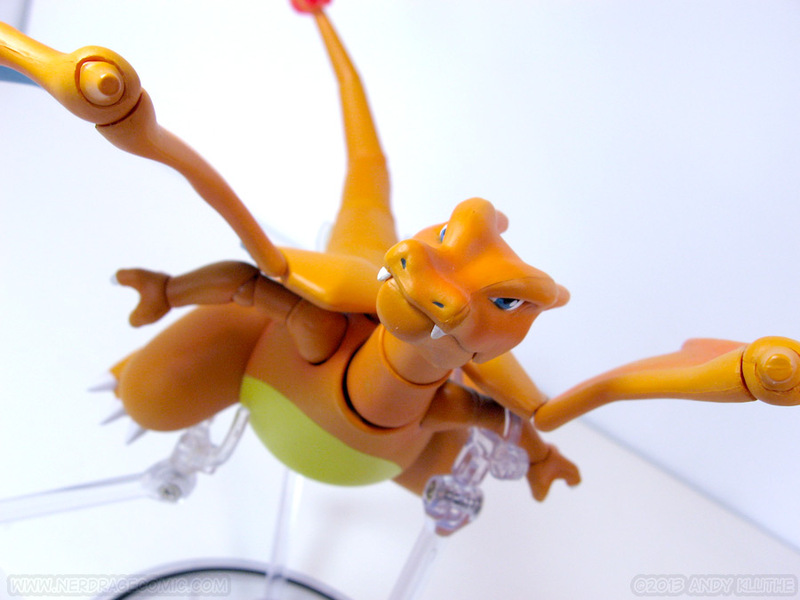 I had actually planned more aerial pictures for this review, but didn’t have enough stand parts on hand to hold up Charizard and another figure. 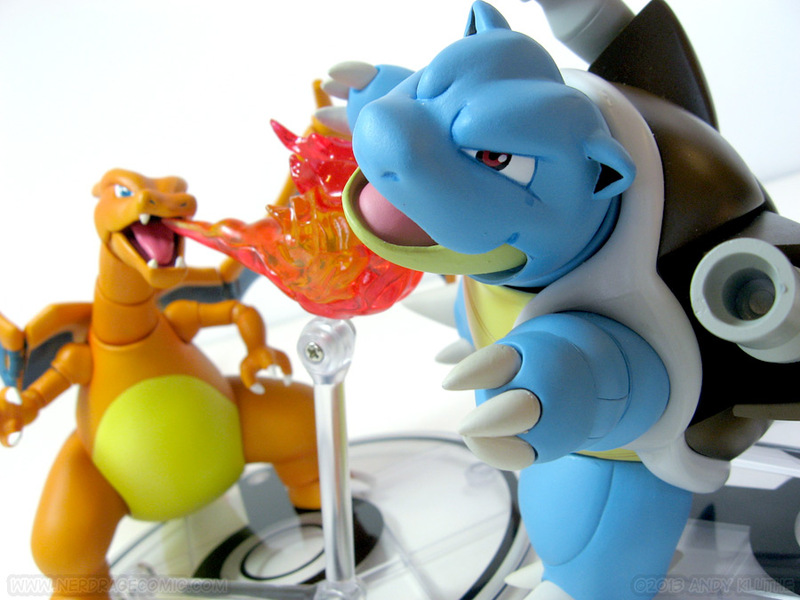 Unlike Blastoise, the stand is really handy for holding up the plastic flame. 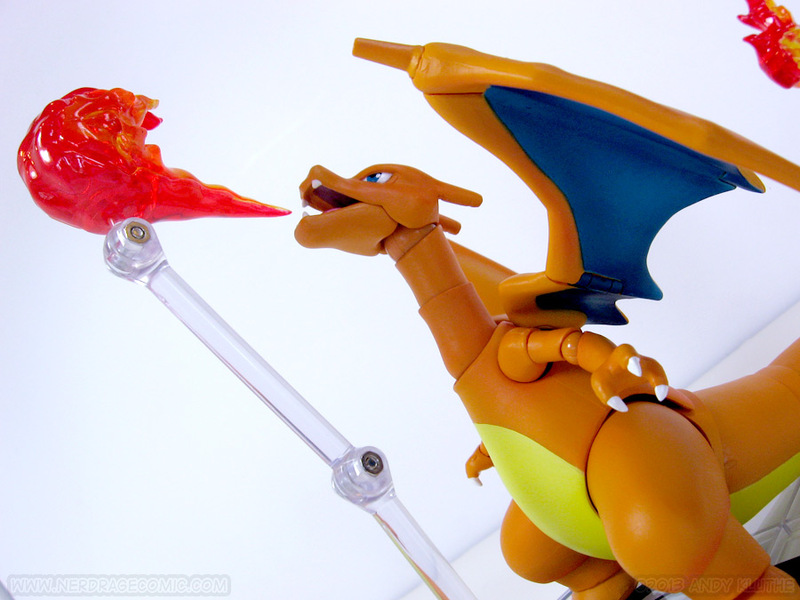 The flame is molded in glossy, clear plastic and the use of a stand to suspend is a lot better than the messy alternative of clipping a piece into his mouth. 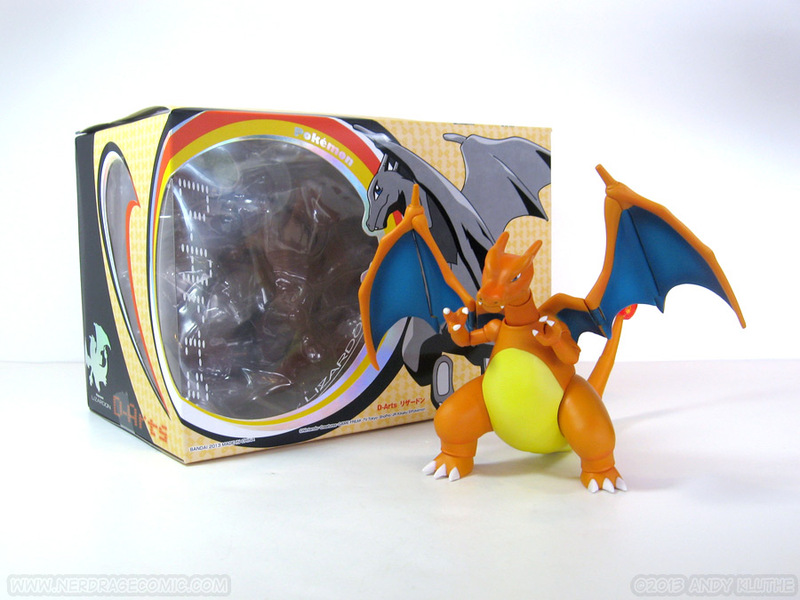 • He’s a nice, big Charizard figure. 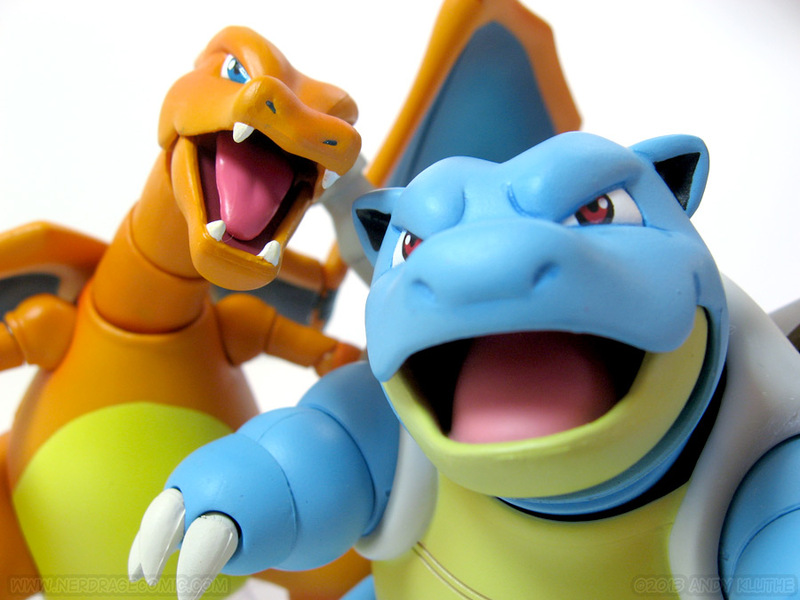 • Looks awesome posed with Blastoise. 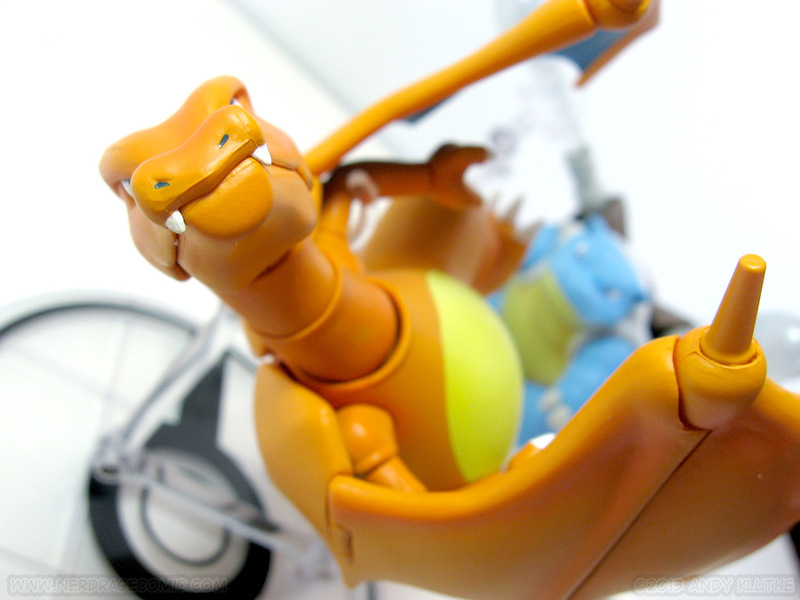 You can put Charizard in a lot of cool poses, most of which involve his feet being on the ground. 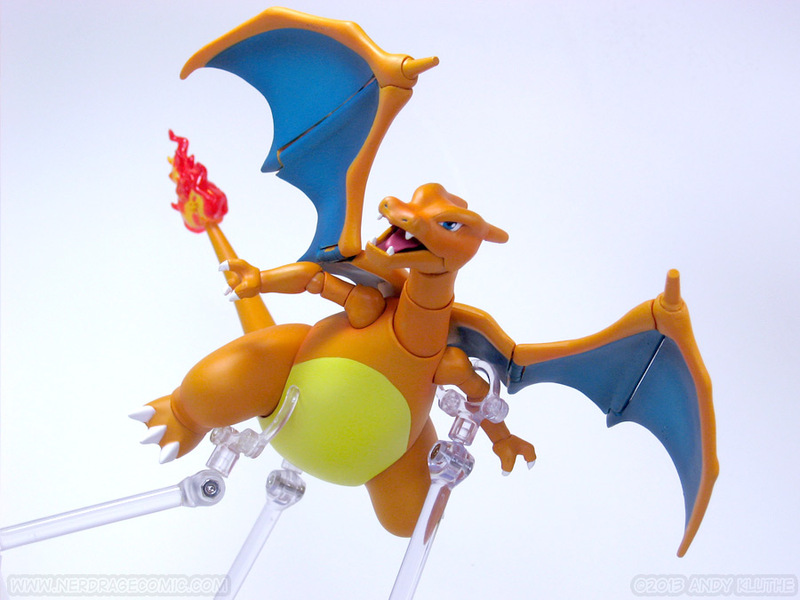 This is definitely the pinnacle in Charizard articulation, if anyone was keeping track of that. While the paint job looks great, I do worry about how well it’s going to hold up. It’s already showing signs of wear. And while segmented tails look cool while fiddling around, Mewtwo’s has already succumbed to gravity and does not hold a pose as well as it originally did. 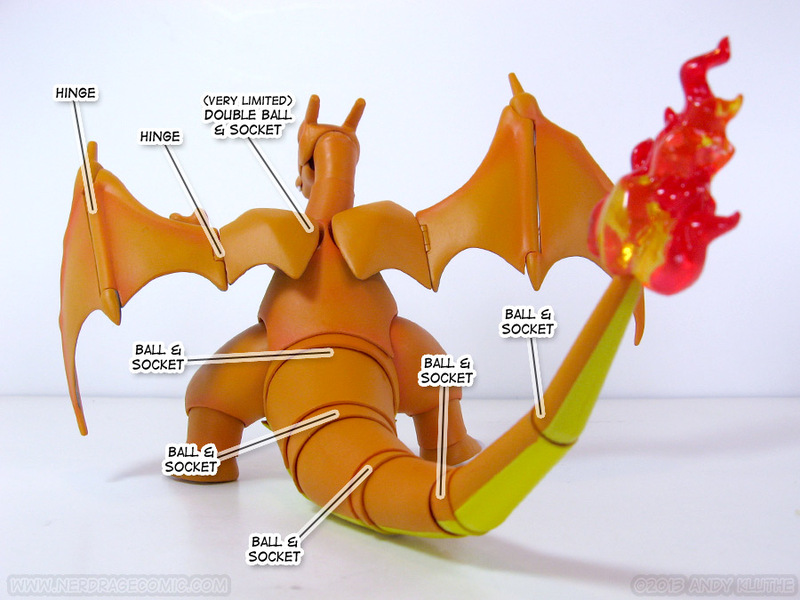 I guess time will only tell how Charizard ages. 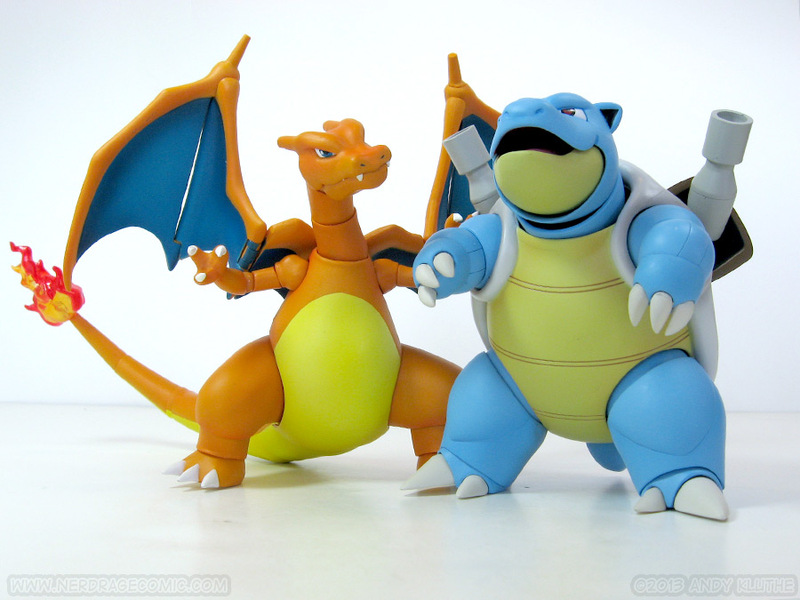 Besides that, he is a big, weighty figure and looks great if you have Mewtwo or especially Blastoise. Venusaur comes out later this month, so stay tuned for a review on that. Until then, this is where I normally plug a site where you can buy this figure. 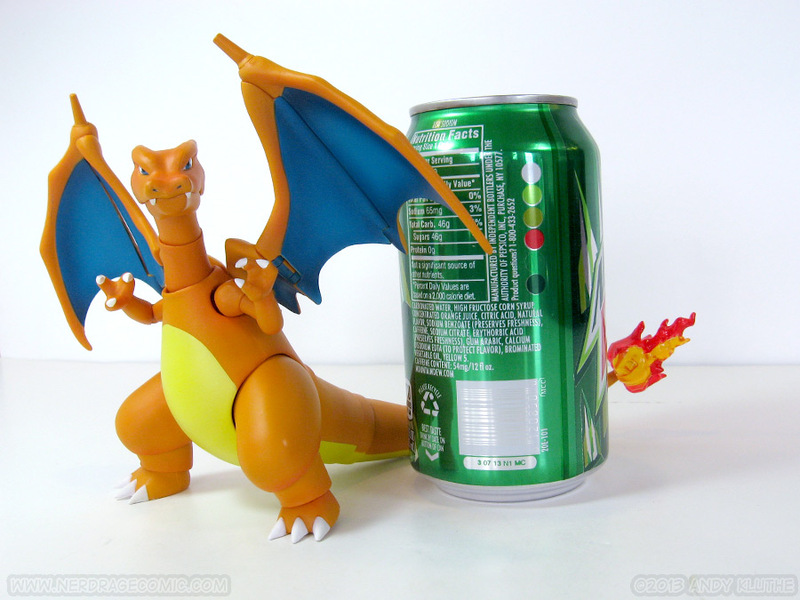 Charizard is long, long, long out of production – I put in the order in April. 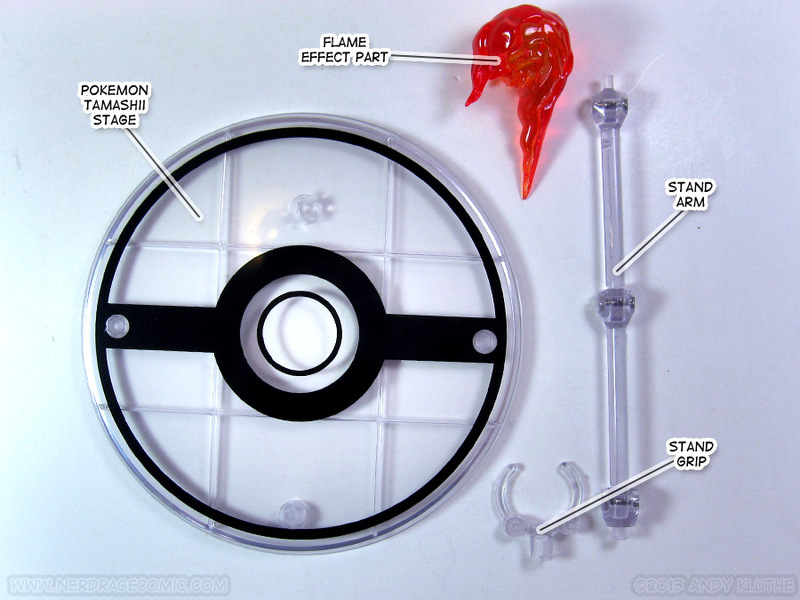 Bandai did just announce a November reissue for Mewtwo, though, so maybe the others aren’t far behind. Keep an eye out on Amiami or HLJ if you want to catch ‘em all!